People deal with the stress and strain of relationships in different ways. Some choose to flee. This coping technique is very popular in our divorce and high tension society. We should realize that "Marriage means expectations and expectations mean conflict." (Paxton Blair) Overwork, overeating, drinking, affairs and drugs become escape vehicles for those seeking to escape. Those who opt to run are often disheartened when similar conditions surface in a new job, business, a relationship, or marriage. Others fight. Many are unwilling to accept other's differences. They cannot disagree without becoming insensitive and ruthless. Conflict breaks out and families are ripped apart, friendships are ruined and partnerships are dissolved. 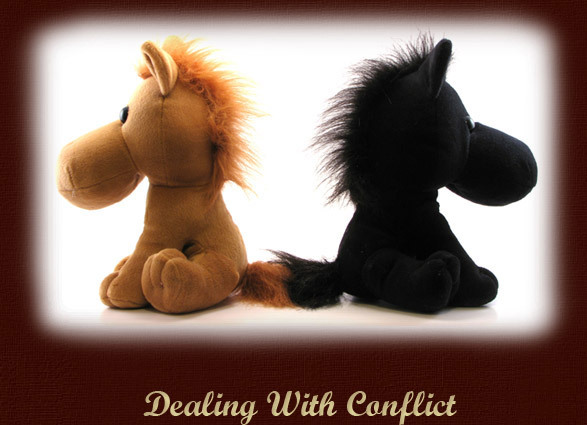 Conflict is a costly means of dealing with difficulty. There are casualties on both sides. Innocent people suffer and some die. The impact of conflict, the aftermath of engagement often takes a toll on the combatants and it weakens their ability to love or trust others. It's difficult for people to choose forgiveness as a means of managing conflict in relationships. "You cannot choose a person's response to you, but you can always choose your response to them. It is not what others do or even our own mistakes that hurt us the most; it is our response to those things. Our response to any mistake affects the quality of the next moment. "(Steven Covey) The only antidote for anger and bitterness is forgiveness. The golden rule Jesus taught is our answer, "Whatever you want people to do to you, do also to them." Samuel Johnson said, "The fountain of content must spring up in the mind, and the person who has so little knowledge of human nature as to seek happiness by changing anything but their own disposition, will waste their life in fruitless efforts and multiply the grief they proposes to remove." Some emotional debts that people owe are legitimate. The father who abused you, the mother who abandoned you, the business partner who deceived you, the friend who used you, the spouse who betrayed you, they deserve to pay. Of course, since "all have sinned and fall short of the glory of God," we also deserve to pay for what we have done, because all have broken the laws of God. When we look at the faults of others through the lenses of our own flaws, we will be compelled towards compassion. Contempt is bred when we major on the imperfections of others. Jesus said in Matthew 7:2 and Mark 11:25, "For in the same way you judge others, you will be judged and when you stand praying, if you hold anything against anyone, forgive them, so that your Father in heaven may forgive you. As we give the gift of forgiveness, it offers the other person a safe place to fail. This powerful gift of forgiveness has one main purpose: to protect us from the harm that comes from wrongs done against us.